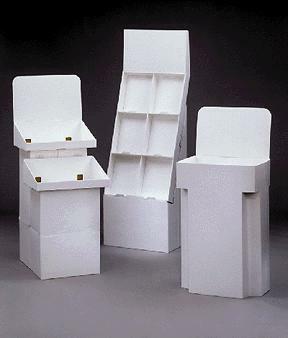 Our stock displays and ballot boxes are a cost-effective way to stand out from the crowd. And, because they're in stock, they can be shipped out to you immediately. Saves time – can be shipped to you partially assembled for a nominal fee. Easy to assemble – self-locking construction means no tape, glue or staples are required. Assembly instructions are provided with each display. Customized – affix your own materials or screen print the header cards. We can direct print, litho label, or custom die-cut any header before we ship to you. Versatile – trays form tier displays that can be used as an effective counter display. Stock Displays are also available in Black, Red and Blue. © Copyright 1998 Company Name, Inc. All rights reserved.